Santa Fe 58, Flintridge Prep 23 — Donald Risper scored 16 points, Matthew Corona added 15 points and Damian Santana had 10 points for the Chiefs (8-5) in a Santa Barbara Holiday Classic win. Jake Althouse had six points for the Rebels (3-5). La Habra 75, Rowland 50 — Dameon Thomas had 12 points, Phillip Aguiniga added 11 points and Curtis Hong had 10 points for the Raiders in a Wilson Tournament loss. Whittier Christian 42, Buena Park 39 — Jake Williams scored 19 points and had six rebounds and Josh Sorely added seven points and had five rebounds for the Heralds, who won the Leon Davis Classic. Also for Whittier Christian, Quinn Commans had 10 rebounds. Williams was named tournament MVP and Justin Osborn earned all-tournament honors. Sultana 54, Whittier Christian 49 — Joleen Corona had 16 points, six rebounds, four assists and three steals and Christa Evans had 11 points and 11 rebounds for the Heralds (11-5), who placed fourth at the Ontario Christian Knight Classic. Also for Whittier Christian, Clairessa Watkins had 12 points and 10 rebounds and Dashell Vasquez had 10 points. LA PUENTE — The third time proved to be the charm for the St. Francis High School basketball team. Joey Walsh scored 31 points and Malakhi Jensen had 16 as the Golden Knights won their first tournament in three tries this month with an 85-70 victory over La Serna on Thursday to take the Nogales tournament title at Nogales High. Sean Stephen had 10 points and Lucas Shin and Omari Moore had nine each for St. Francis, which improved to 9-3. Cedric Sobers had 23 points and Daniel Canales 17 for the Lancers, who slipped to 12-2. St. Francis, after La Serna pulled within 28-25 late in the second quarter, closed the first half with a 10-5 surge to lead 38-30 at halftime. The Golden Knights then pushed the advantage to 13 at 47-34 in the second half following a 5-foot leaner by Walsn and a three-point play by Jensen. La Serna twice cut the deficit to seven points, the second at 58-51 following a layup and two free throws by Sobers a minute into the fourth quarter. But St. Francis countered with a Jensen’ 3-pointer, a Walsh’ three-point play and a Sean Stephen 3-pointer for a 77-62 lead with 2:02 left to play. HACIENDA HEIGHTS — Whittier High School boys basketball coach Chris Dalley said he and his team sat on the bench reflecting on what could have been.The Cardinals handled tough Charter Oak 78-63 in the Wilson tournament championship game on Thursday night. But Dalley said he and his team thought about how they could’ve won two tournament championships this season. He was referring to a 55-51 heartbreaking loss to San Dimas earlier this month in the Glendora Winter Shootout championship. Dalley said the win over Charter Oak was redemption. Tournament Most Valuable Player Jesus Gomez sparked a second-quarter surge for the Cardinals for a 40-23 halftime lead. He scored 14 of his 31 points in the quarter while coming off the bench. Gomez is normally a starter, but sat out the first quarter because of disciplinary reasons. After Gomez entered the game, Whittier (9-5) outscored the Chargers 25-12 in the second quarter. He hit the first of his three 3-pointers in the quarter to put Whittier up 27-16. Gomez ended the quarter by drilling a 3-pointer at the top of the key with 2 seconds left to give Whittier a 17-point cushion. 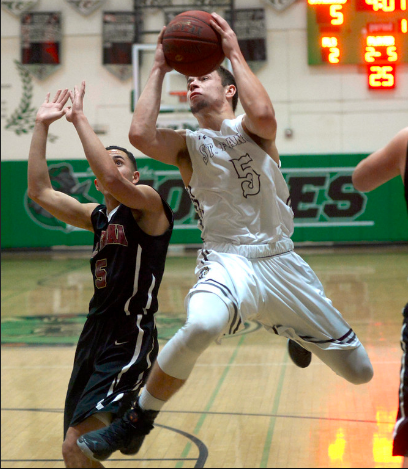 Spencer Torres scored 17 points for Whittier. All-tournament selection Alex Rodriguez had 13 points and seven rebounds for Whittier and Andrew Martinez scored 10 points and pulled down 10 rebounds. While Whittier’s offense got rolling, its defense stepped up too. The Cardinals forced 24 turnovers. Whittier Christian 54, Ontario 49 — Jakob Williams had 21 points and eight rebounds and Zach Schauster had nine points for the Heralds (9-4) in a Leon Davis Classic victory Tuesday. Whittier Christian 60, Linfield Christian 16 — Christa Evans had 12 points and seven rebounds and Dashell Vasquez and Joleen Corona each had nine points for the Heralds (10-4) in an Ontario Christian Classic second-round victory. Whittier Christian will play against Chaffey today at 10:30 a.m.
Whittier Christian 70, Hawaii Baptist 34 — Jakob Williams had 14 points and Zach Schauster had 13 points for the Heralds (8-4) in a Leon Davis Holiday Classic first-round victory Monday. Also for Whittier Christian, Justin Osborn had eight rebounds. Rowland 63, Whittier Christian 37 — Freshman Dashell Vasquez had 10 points and sophomore Clairessa Watkins had eight points and eight rebounds for the Heralds (9-4) in an Ontario Christian Knight Classic pool-play loss. Whittier Christian will play Linfield Christian today at 3 p.m.
Montebello 49, La Serna 39 — Kyannie Brown scored 21 points and Alisia Trejo added 15 points for the Oilers (10-4) in a nonleague victory. California 3, St. Anthony 0 — Frank Quirarte, Steven Moya and Alex Garcia each scored a goal and David Arias and Daniel Oropeza each had an assist for the Condors in a nonleague victory.